13.992 Acre Flood Irrigated Property offers 4,506 SF Main Home w/ 5 Bed + Office (Master Downstairs), 3.5 Bath, 3 Car Garage + 1,600 SF Guest Home w/ 2 Bed, 2 Baths & 2 Car Garage + 14 Stall, 5,670 SF Barn w/ touch controlled lighting, automatic water system in each stall with sensors to monitor water consumption, tack room w/ built-in saddle racks, vet stocks for grooming or interior wash rack, exterior wash rack, office & bathroom. Equestrian amenities include multiple pastures, corral & arena. 4.553 Acre ''You Pick'' Orchard generates $40-60K in annual revenue + $60-120K in annual tax write offs + $45,000 for Guest House & $65,000 for Horse Stalls ($160,000 revenue+$90,000 est. in Tax Write Offs). 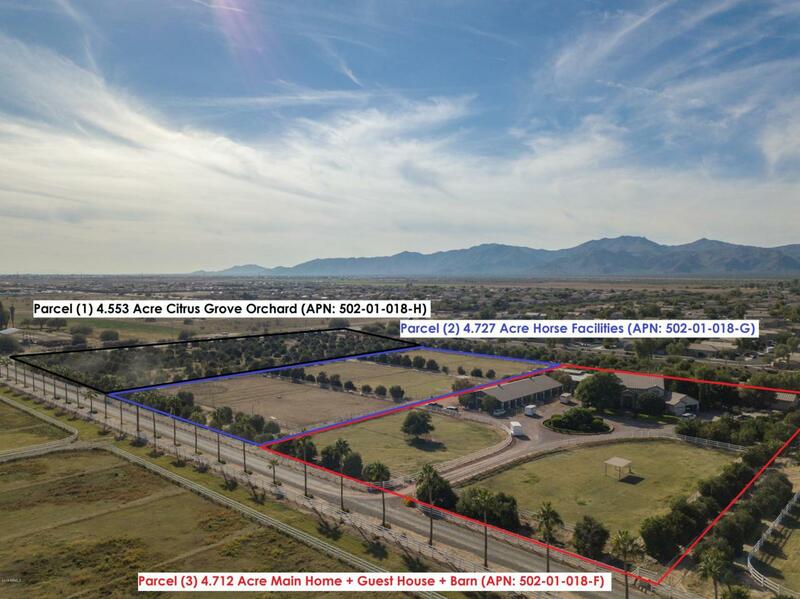 Owner will sell parcels individually and is open to creative financing for the right buyerListing is for the sale of the following three parcels: (1) 4.553 Acre Citrus Grove Orchard (APN: 502-01-018=H), (2) 4.727 Acre Horse Facilities (APN: 502-01-018-G), (3) 4.712 Acre Main Home + Guest House + Barn (APN: 502-01-018-F).